Bay Area Bin Support is the very first-of-its-kind push and pull service company providing trash, recycle and compost bin service for all types of properties including multifamily and commercial properties across the Bay Area. 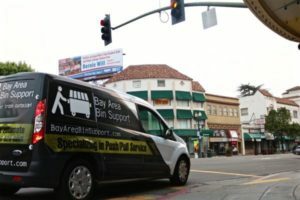 Bay Area Bin Support is the San Francisco Bay Area’s very first ever push pull service company. We work with apartment communities, multifamily and commercial properties providing curbside push and pull service for garbage, recycle and compost bins. We understand that garbage can cause many issues for property managers and owners, such as overflowing containers, messy waste enclosures, and missed pick-ups, not mention the ever-increasing fees charged by local waste management companies. That’s where Bay Area Bin Support can help. We service all waste containers ranging in size from the largest 4-cubic yards to smaller 20-gallon containers and everything in between! The Bay Area Bin Support team will make sure that your containers are pulled out to the curb the same day as collection service, properly secured and then placed back quickly – usually within a couple of hours after being serviced. And, as a commitment to providing the highest standards in customer service, Bay Area Bin Support does not pull or leave bins out overnight or out on the street for prolonged periods to time. What is Push and Pull Service? Push and pull service is an extra fee found on your monthly garbage bill and it is the cost of having the garbage company bring your containers from your property to the curb. In some cities, these fees can quickly add hundreds to thousands to your monthly garbage bill. You can hire Bay Area Bin Support to bring your containers curbside for a fraction of the cost with the added benefit of cleanup in the enclosure area, overflow monitoring and assistance with any other issues as they arise. The local garbage company will still do the disposal portion of your service and we will coordinate closely for seamless service. These fees are also sometimes referred to as push fees, distance fees, elevation fees or backyard fees. Check your bill closely and contact us to find out how we can help you save! We understand the waste industry and local regulations, helping you benefit from our expertise and providing greater value for our clients. From helping owners and property managers save hundreds to making sure your waste spaces are clear of debris, there are many reasons to hire a push pull service like Bay Area Bin Support. Read our latest posts. Copyright © 2018 Bay Area Bin Support.